It is advisable to place all the tuners in such positions that the strings can pass in a straight line and are not bent at all, or if, only slightly. The nut will be grateful to you for heeding this advice and you will also have less trouble tuning the guitar. Positioning the tuners with this in mind is relatively easy when all tuners are fitted on one side of the peghead. 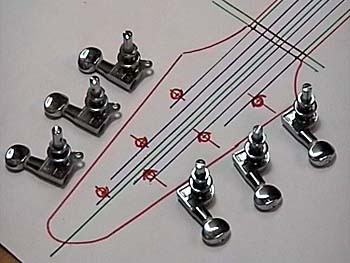 When tuners are fitted on both sides of the peghead a straight string line can only be achieved by mounting the tuner pairs succesively closer to each other towards the end of the peghead. Unfortunately, the tuners traditionally used do not allow a symmetrical layout of the two top tuners as the distance between the two middle strings is too small. The solution is to use a staggered tuner layout, which inevitably makes the peghead asymmetrical. The advantage of the strings being able to pass in a straight line is, however, offset by the fact that this makes it more difficult to use a truss rod adjustment wrench to get at a truss rod nut mounted on the peghead side of the neck, as the middle strings block access to the nut for almost any wrench - allen keys excepted. Another potential drawback is a merely optical one: the rather small peghead might not really look good on the guitar.